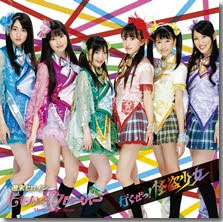 bunny☆kaisui's blog: PV of ももいろクローバー(Momoiro Clover)'s latest single is out!! PV of ももいろクローバー(Momoiro Clover)'s latest single is out!! ももいろクローバー(Momoiro Clover)'s first major single was announced some months ago, but today Stardust official Youtube channel uploaded 行くぜっ！怪盗少女(Ikuze! Kaitō shōjo)'s PV! What do you think? I love it!! Both PV and song are really good! I like they all have solo lines, you can see they personalities and enjoy the song a lot more. Also, I really like many changes of the song but I specially like the chorus ^^ and Ayami's "Mirai uchi" (I think she says that ^^U) !!! You can see photos of each jacket in their official website here! Let's all hope they do well with sales! !